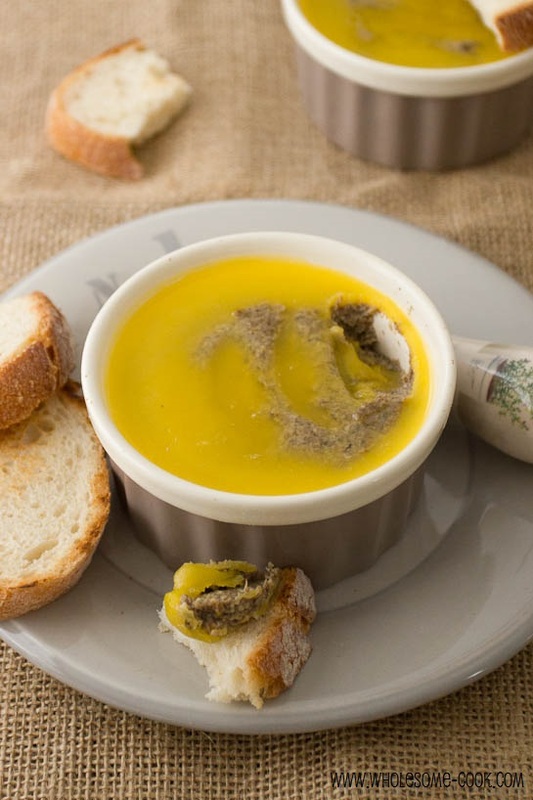 This easy to make Mushroom Pâté is a tasty vegetarian rendition of the French classic. 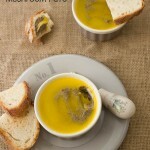 Better still, the pâté can be frozen and used as a flavourful addition to soups and stews. Slow cooked (or confit) duck leg meat can be substituted for mushrooms if you’re not a fan of mushies. 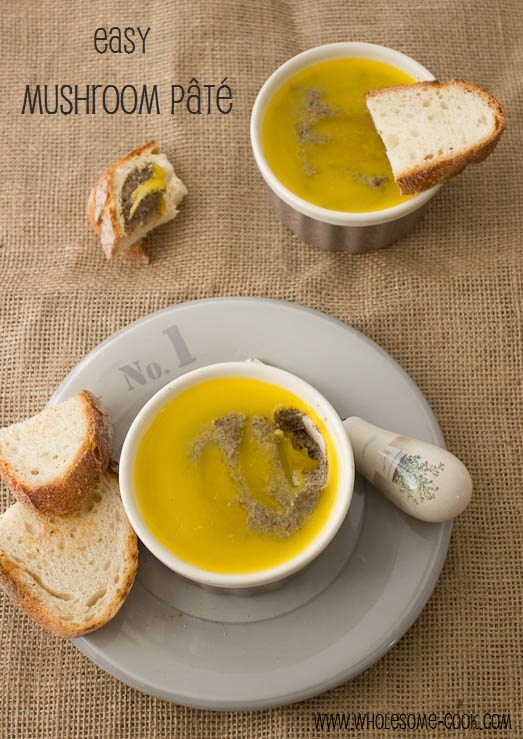 PLUS share your favourite mushroom recipe to WIN a copy of my Mushroom Sauce mini eBook! Congrats to Jayne! Mushrooms are one ingredient that you either love or hate. Personally, I am a mushroom lover. I have been known to put sliced mushies on grilled cheese sandwiches – something I inherited from my years growing up in Poland where the only “junk food” available back then were grilled Mushroom and Cheese Baguettes sold on most street corners. Creamy Mushroom Sauce is my favourite topping for steak. I’ve even created this mini Mushroom Sauce eBook with 5 nifty uses for the sauce and 10 flavouring ideas. Mushroom Sauce eBook Giveaway (Closed): Simply leave a comment telling me your favourite mushroom recipe – the tastiest sounding recipe will win so get creative. I’ll pick announce the winner on Monday 1st July. And the winner is…Jayne! Congrats and thanks to everyone for sharing their yummy mushroom creations. PS For the next couple of posts, I am going to go a little butter heavy. Why? Because, unless you are vegan or lactose intolerant, pure butter makes for a much healthier choice than any other (especially “vegetable” oil!) spread. It tastes better, and if you are after a more natural spread butter is it. More about the ins and outs of the Butter vs Margarine Debate on Friday. The mushroom Pâté can be served alongside your favourite crackers or toasted bread, but is also great for freezing as a paste and adding to soups, stews and sauces. You can use slow cooked or confit duck leg meat in the recipe - just add 1/2 cup of white wine at the start. Brush off any dirt from mushrooms and slice them finely. Heat 1 tablespoon butter in a large saucepan over medium heat and add mushrooms, thyme, pepper and salt. Cook stirring until the mushroom have browned and wilted. Add orange juice, zest and port and cook for a further minute or so, stirring, for the liquids to cook down. Add extra salt if desired. Remove from heat. Using a stick blender, blend mushrooms until smooth (or leave it lightly coarse if you prefer). Divide pâté between 2 ramekins - or spread one serve into an ice cube tray if using for sauces, and allow to cool. Melt butter or ghee and pour over the top of the pâté. Allow to set before serving. there is a place called the Old Mill in Dublin, Ireland that has an entree of these crumbed and deep fried mushrooms served with a garlic sauce, they are crispy on the outside, juicy inside and so delicious when dipped in the sauce! Your pate is so intriguing! Love it 🙂 I am a massive mushroom lover too. My favourite way of using mushrooms is by braising. Usually in a deep dark sweet & savoury pork stew. My auntie makes the best. The pork and meaty mushrooms (usually shitake or eryngii) are stewed for about 2 hours until the sauce becomes a sticky glaze. So so good! Lovely recipe I want to try soonest: I have used cognac rather than port and have not used orange juice either, so, loving mushroom pate as much as I do, am really looking forwards to that! Have not dare freeze it either: just have made smaller amounts . . . that’s another lesson 🙂 ! I love butter ! I love mushroom pate on garlicky country toast and mushroom risotto also makes me happy. I love making a pizza with broccoli and shiitake mushrooms. I know most people don’t use shiitake on pizza but it’s really yummy. I like mushrooms sautéed in butter until crispy and then add a little balsamic vinegar and reduce it down. I don’t always like mushroom, but this pate recipe sounds awesome. I love this idea! I’ve seen it done a couple itmes now and have been meaning to try it. I think it’ll be a hit for my mother! Love the layer of butter on top. Also love the idea of adding it to soups/stews, never thought of it! Will be making it in our next party. This is a recipe I’d surely gonna try this weekend!!! I like taking baby portabellos and button mushrooms, about one pound total, chopped in coarse slices, saute in pan with butter, small chopped onion, add 2 or 3-tsp. worcestershire sauce, salt/pepper and when it looks very done and water is all gone…add a few drops of hot sauce…..goes great with beef. There were a few great entries into the mini giveaway.. I loved patnj’s worcestershire sauce idea, TC’s exotic mushroom pizza sounded nice too but the overall standout was… Jayne Aunty’s Sticky Braised Pork and Mushrooms – I can just imagine the wonderfu flavours and textures! Congrats Jayne! Hi Martyna, might be a silly question but if making this (fantastic sounding!!) recipe with the duck – do I add white wine… and still use port? Hi Meganska, yes, I would add the wine and cook it down a little longer in the first stage to get the flavours intensified. The port adds a sweet smoky flavour so definitely keep it too.